I'm quite proud of this program and it's design. Though if you are doing professional 3D you would want to rig cameras and composite your work by hand. If you use Max and like making 3Dstereo images you should definitely download it. (versions for Max 3 and above have a new help system). please consider compensating me for the work. 2 blank frames at the beginning of AVIs. 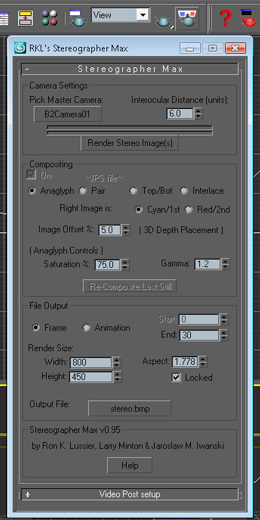 Should work with all 'higher' versions of 3ds Max. Some of the writing-to-codecs problems should be fixed by Max4+. This is a screen shot of Stereographer Max for Max 9.